The NAHB/Wells Fargo Housing Market Index for June increased to 59, a five point rise from May and tied for the highest since September 2014. 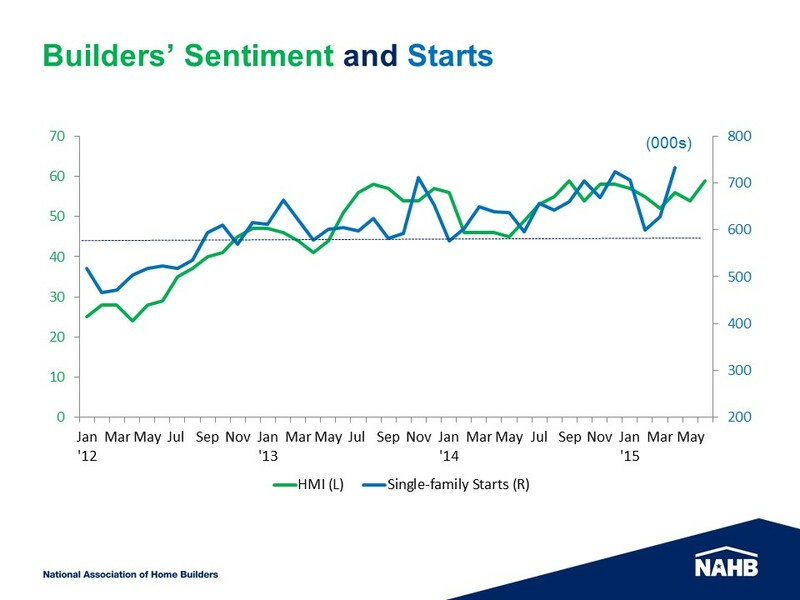 The increase in builder confidence aligns with other recent positive housing news. April starts and permits were up significantly from a depressed March. Single-family starts rose 16.7% from March and were the highest monthly level since January 2008. Single-family permits also rose 3.7% in April. New home sales rebounded in April to a 517,000 annual rate and the year-to-date total is 23% ahead of 2014. Purchase mortgage applications have been increasing. And, the last two quarters of data show a strong increase in household formations. More households mean more houses are needed. Some of those may be rental apartments but the increase still puts pressure on rents and the need for more housing. The underlying components of the HMI also showed strong increases. The current sales component increased 7 points to 65 the highest since November 2005. The expected sales index rose 6 points to 69 and also the highest since October 2005. The traffic index rose 5 points to 44, matching the January level. The strong rise in current and expected sales is an indication that home shoppers are more certain about their buying decisions than those in the recent past market even with less movement in the volume of shoppers. Three regions increased their three-month moving average while the Midwest fell 1 point to 54 where it has resided in 3 of the last 7 months. The Northeast rose 3 points to 44 but still not as high as the first two months of 2015. The South rose 3 points to 60 and back to the high it achieved in late 2014. The West rose 2 points but still well below early 2015. The quarterly averaging includes some lower monthly reports for all regions except the South. The HMI reached a cyclic peak of 72 in mid-2005 and fell to an all-time low of 8 in January 2009. It took 3 ½ years to fall and has taken nearly 6 ½ years to get back to 59.